That is a long time to go without scoring a goal. Well, that's not entirely true. Craig Adams or Tanner Glass can go 16 games without lighting the lamp and nobody would really notice. After all, they're not really paid to score goals. Their job is to play that gritty game that true fans of the sport love. Evgeni Malkin, on the other hand, IS paid to score goals; and for the past 16, Geno couldn't take his 8.7 million-a-year salary and buy one. Posts went *clang* and the goal line grew ever more elusive. The drought reached a point where Malkin began passing up advisable shots in order to feed the puck to someone not on the schnide. Last night however, against the Islanders, Malkin finally put the biscuit in the basket. Baked goods and their containers aside, scoring a goal will certainly boost Malkin's shot confidence. I know I'm not telling you anything you don't already know, but pause for a moment and put yourself in his place: You're a 4-time All Star, Stanley Cup Champion, 50 goal scorer and 2-time Art Ross winner. You've won the Calder, Ted Lindsay and the Hart, and here you are - struggling to get just one behind a net minder. Finally getting a goal, not just an assist (of which he has 20), can only put his mind right as to what type of game he can bring. It wasn't a highlight reel goal by any means, but its short and long term effects could be beautiful. 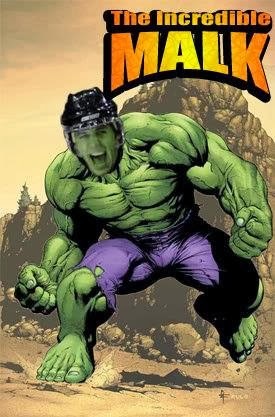 Now that the monkey is off of his back, hopefully we will see Malkin turn green and grow to incredible size more often. Here's to hoping that this is really the return of #TheIncredibleMalk.